It has arrived! We are finally back to bouting on our home rink in Appomattox! This also isn’t your average bout we have planned, it will be the first time we have faced a co-ed team in front of our home crowd. 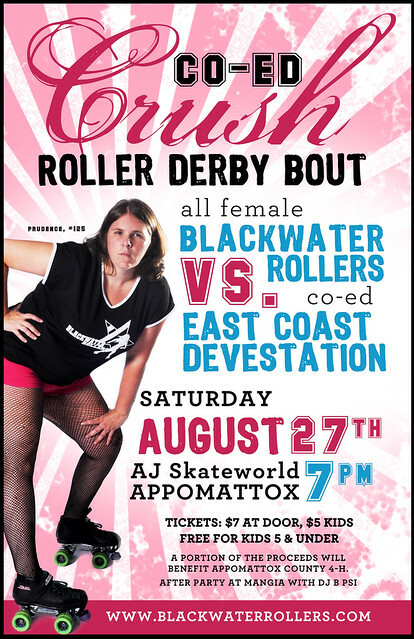 We will gearing up and taking on the East Coast Devastation out of Nova. If you are impressed by fancy footwork and pure strength, you will want to come watch this team! We have developed a liking for each other, scrimmaged a couple times, have borrowed one of their star players to coach us at our away bouts and are excited to welcome them to Appomattox once again. We also have a unique half time show lined up too that you will not want to miss. DJ B Psi is back mixing the tunes, Mojo Lono will be carrying you through the bout and Mangia is still hosting our killer after party. All your favorite skaters will be on the rink along with a few new fresh faces you will want to get to know! A portion of our proceeds will benefit the Appomattox County 4-H so come on out! For more information, go check out our facebook event page and see you there!